par John D. Clark, Sr. There are few areas of life where more harm has been inflicted on hurting souls by ministers themselves than in the turbulent and delicate area of marriage, divorce, and remarriage. I have seen hearts broken and homes divided by the misguided counsel of religious leaders – well-meaning men and women, certainly, but without the knowledge of God. “The wisdom that is from above”, wrote James, “is first pure, then peaceable, gentle, and easy to be entreated, full of mercy and good fruits, without partiality, and without hypocrisy.” The truth about God’s will concerning marriage and divorce will bring peace and other good fruits into the lives of those who receive it, and that is the true measure of all teachings that really come from God. Within the community of believers, there are two basic groups, as regards marital status. They are as follows: 1. The Unmarried A. Those who have never married. B. Widows and Widowers. C. Those divorced before their conversion. 2. The Married A. Those married to another believer B. Those married to an unbeliever. C. Separation and Divorce. Before giving counsel to anyone, the wise pastor will first determine to which group and subgroup the person being counseled belongs because the counsel of God differs for each group. The commandments of God are always directed toward specific individuals or groups. If, for example, someone in Israel had assumed that God’s commandment to make incense for the altar was for everyone, they would have lost their lives (Ex. 30:22-38). That commandment was for the priests alone, and not even all of them. Other commandments were only for Israel’s judges; others, for every Israelite. It is of first importance, when considering the application of any of the commandments of God, to ascertain to whom God is speaking. Failure to do so could result in tragic consequences, as we have often seen in the misapplication of commandments related to marriage and divorce. This is the unfortunate case with many who, upon reading Jesus’ words in Matthew 19 concerning marriage and divorce, assume that the Lord’s words apply to all marriages. The heartache and confusion this sort of error has caused is immeasurable. With each new tale of a home being divided, or of a young life being robbed of its joy by such bad counsel, my fervor to make known the truth of the matter grows. As young Elihu said, after waiting for some wisdom to be shown by the elders before him, I have waited in vain for someone among the leaders of God’s people to speak out clearly on this matter, but I have not yet heard any of them do so. Is this silence the result of ignorance? Or is it that the leaders of God’s people feel it isn’t wise to speak out plainly on the matter of marriage and divorce? Is my eagerness to get this message out the typical impatience of youth? Or is it with me as it was with young Elihu, when with burning frustration, he concluded, “Great men are not always wise; neither do the aged understand judgment” (Job 32:9)? 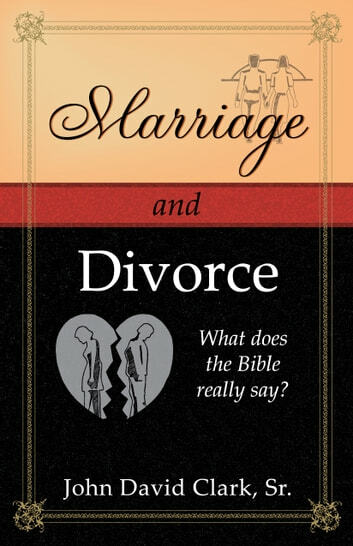 The pain that I have seen inflicted upon earnest and humble souls by well-intentioned but ill-informed ministers is great, and the availability of the truth that would set these damaged lives free is so scarce, that I am compelled by the love of God to provide this booklet of biblical truth concerning marital issues. My hope is that you will gain from these instructions a deeper appreciation of God’s love and compassion for His hurting sons and daughters who find themselves in difficult marital situations. Nowhere in the Bible does God give instruction to unbelievers concerning marital issues. The commandments of God are, without exception, given to those who believe. The standing commandment for sinners is simply to repent. 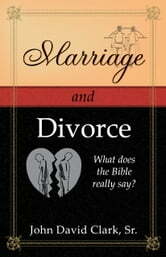 Livres similaires à Marriage & Divorce: What does the Bible really say? Plus de titres de John D. Clark, Sr.